We all want to have clear skin. It is one of the first things that people notice about your appearance, and there’s no doubt that a poor complexion can leave you feeling less than confident. The beauty industry is inundated with countless creams, elixirs, ointments, and makeup marketed to zap away and cover up blemishes. However, what we often forget is that our outer appearance starts on the inside. In fact, your skin is your body’s largest organ and makes up 10 percent of our total body weight. One of your skin’s main responsibility’s is detoxification. For example, sweating is your body’s way of releasing toxins through your skin. It would only make sense that acne, psoriasis, rashes, eczema, and rosacea are all symptoms of something going on deep beneath the surface. As a functional medicine practitioner, I see skin problems as a common struggle among my patients. These patients are suffering from a variety of different skin health issues, but one thing almost all of them have in common is gut dysfunction. 1. Stay clear of skin-damaging foods. Sugar, even an overload of natural sweeteners like coconut sugar and honey, can majorly contribute to a poor complexion by feeding the bad bacteria in your gut. Grains also contain amylose sugars and similar proteins to gluten that can continue to perpetuate gut dysfunction. 2. Uncover your food intolerances. Every person’s biochemistry is unique, and therefore every person is going to battle different food intolerances. Learning which foods trigger an inflammatory response will help you to avoid them and instead choose the superfoods that make your skin glow. An elimination diet is the gold standard for finding out which foods work for you. 3. Soothe your skin with coconut oil. Is there anything coconut oil can’t help with? Not only is this oil a great choice for cooking due to its high content of gut-supporting healthy fats, but it is also antimicrobial, making it a great choice for a makeup remover or moisturizer. 4. Load up on probiotics. 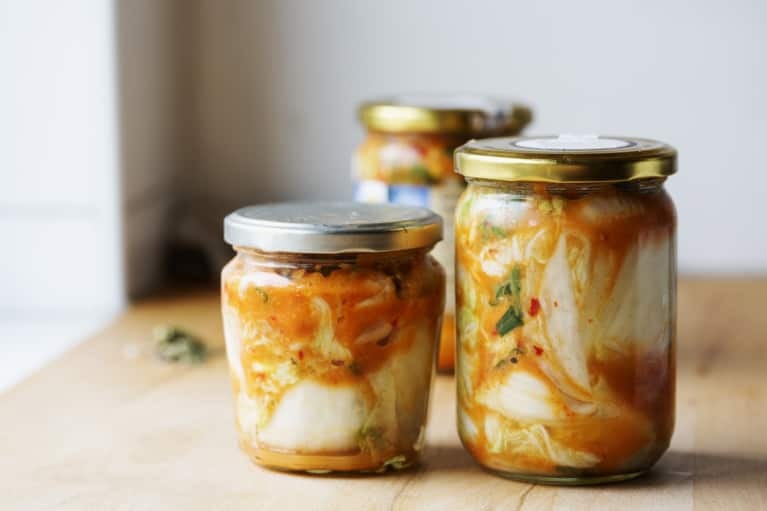 Foods like sauerkraut, kimchi, and kefir are filled with gut-healing probiotics. Add these to your diet for a daily dose of good bacteria to rebalance your microbiome and keep your gut in tiptop shape. This protein is comprised of three amino acids—glycine, proline, and hydroxyproline—and makes up our connective tissue including our cartilage, bones, blood vessels, tendons, and our skin. It regulates our own collagen production and promotes skin elasticity to keep you looking youthful. Adding a collagen supplement to your wellness routine can be very beneficial as most people only get 3 grams of glycine out of the required 15 grams per day through diet. 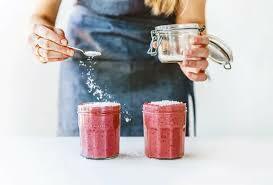 You can add collagen powder to your morning tea or smoothie. 6. Have fun with adaptogens. These plant and herb medicines are some of my favorite tools to help bring balance to every system in the body‚ your skin included. Pearl powder in particular is packed with amino acids that help nourish your skin. Holy basil also works to reduce inflammation and promote a youthful appearance. With adaptogens increasing in popularity among celebrities and the wellness world as a whole, it is easier than ever before to find these magic powders. You can experiment with adding them to your elixirs, smoothies, coffee, and sprinkled on top of your favorite dishes. Not only does sipping on bone broth soothe a damaged and inflamed gut (since it is packed with collagen), it also helps restore dull skin by encouraging elasticity. There are a ton of fun, creative bone broth recipes out there, so go ahead and incorporate this food as medicine into your day. This B-vitamin aids in fatty acid synthesis, and since our skin is exposed to harsh environmental elements like sun and wind on a daily basis, your skin cells rely on fat as protection. You can get biotin through supplementation as well as through whole food sources such as avocados, wild-caught fish, grass-fed beef liver, and eggs. Epigallocatechin gallate is a type of antioxidant polyphenol that fights cell-damaging free radicals that lead to signs of aging. Found in abundance in green tea, specifically matcha, studies have shown that EGCG can even rejuvenate skin cells that are dying. 10. Tone with apple cider vinegar. Using apple cider vinegar as an after-cleansing toner can help diminish the appearance of blemishes by balancing your skin’s pH levels. I also suggest it to my patients for other skin issues; in fact, one study showed that apple cider vinegar was able to reduce the appearance of eczema in just three weeks.